Anzac Day goes beyond the anniversary of the landing on Gallipoli in 1915. It is the day on which we remember Australians who served and died in all wars, conflicts, and peacekeeping operations. The spirit of Anzac, with its human qualities of courage, mateship, and sacrifice, continues to have meaning and relevance for our sense of national identity. The Anzac tradition—the ideals of courage, endurance and mateship that are still relevant today—was established on 25 April 1915 when the Australian and New Zealand Army Corps landed on the Gallipoli Peninsula. It was the start of a campaign that lasted eight months and resulted in some 25,000 Australian casualties, including 8,700 who were killed or died of wounds or disease. The men who served on the Gallipoli Peninsula created a legend, adding the word ‘Anzac’ to their vocabulary and creating the notion of the Anzac spirit. In 1916, the first anniversary of the landing was observed in Australia, New Zealand and England and by troops in Egypt. 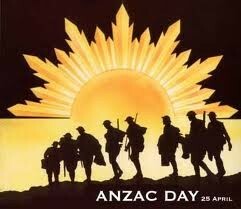 That year, 25 April was officially named ‘Anzac Day’ by the Acting Prime Minister, George Pearce. By Kenny, Ali and kage.